First of all let me say wow! I didn’t realize it had been so long. I started watching kids and then stopped. I have started crafting and selling it on Etsy and Facebook and have written a book and started on my second one. So let me just say oopps for letting my blog drop for so long. So do you need a piece offering? How about a recipe? My girls have started calling these Fancy Porkchops. My husband decided he was going to go on the Keto diet and I have been racking my brain trying to figure out what I am going to cool this man for dinner each night….without making two different dinners. Take your pork chops and season with salt, pepper and your garlic and her seasonings on both sides. Add A little bit of oil to a hot pan and sear your pork chops for about 3-4 minutes on each side. Place in a glass 9×13 pan and throw it in your oven. In the same pan you were cooking your chops on the stove add one chopped onion and your mushrooms. Cook until the onions are clear and your mushrooms are cooked down. Add about 1 tbs of your garlic and herb seasoning and mix in well. Add 1 1/4 cup cream to your vegetables and cook for 3 minutes then throw in your asparagus and cook another 2 minutes. While thats cooking. Take 1 tbs corn starch and 2 tbs water and mix in a small bowl. Pour into your creamy vegetables and stir. It will thicken quickly. Get to about gravy thickness. Take your pork out of the over and pour your sauce over it. Put it back in your oven for about 15 minutes. When you pull your chops out check the temperature. For pork it should be at 145. I have also served this poured over rice and it was amazing….the husband can’t eat rice on his diet so i have opted without it also and either way it is amazing. I have been gone awhile and really feel bad for that but for the record things have been going on….. First and the biggest is the fact that I have been put on a new diet. Because of new happenings with my body as I have been saying I am on a no dairy no soy no fun diet now. After reading ingredients on EVERYTHING i have decided the only things I could eat were fresh. This popped my naturally ” i am always ready to bake” bubble. 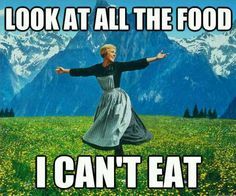 After listening to the doc and cutting out a few things i was still in pain so I decided to put myself on a FODMAP diet. It seemed really easy at first until I realized that also meant giving up gluten. So here we are no dairy, no soy , no gluten, no chocolate and no alcohol. Like I said before no fun diet. It’s bound to get interesting. Just hang in there while I figure out how to teach myself to cook all over again haha. I know it has been awhile, but I made the best Enchiladas tonight. 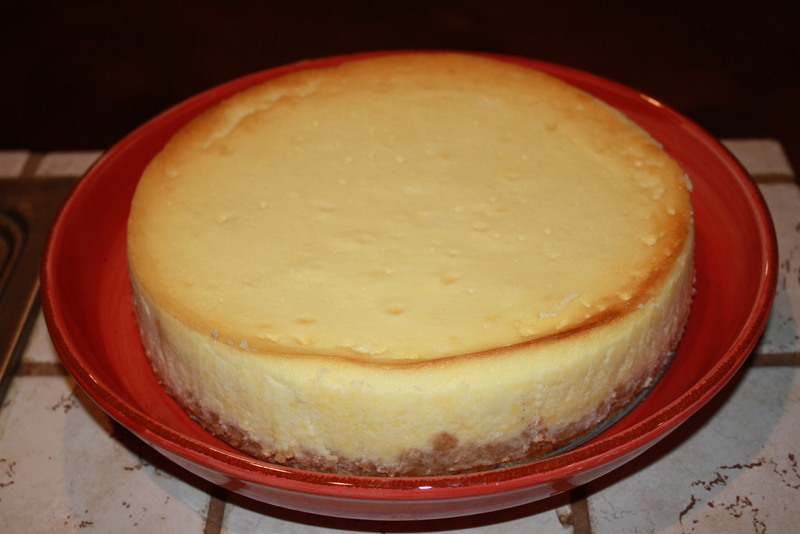 Lately I have not been liking my food….the reason….I am following the recipes :(. I hate it when I do that. So the other day while looking through my recipe books, I ran into a recipe for easy enchiladas. I was instantly hungry because why wouldn’t someone who is lactose intolerant want enchiladas. As I am reading this recipe though I realize a few things…. 1. It calls for Chicken sausage….. These are big “not going to happens” in my book so here is what I came up with. 2 lbs Ground beef (we used deer meat) It has less fat and well my husband is awesome and hunts! 2. Brown your meat in a large skillet (i use cast iron). While your meat is browning add your red bell pepper, onion, and tomatoes. When your meat is brown and your veggies are soft, add your chili powder and cumin. Cook for one minute making sure the seasonings get cooked in thoroughly. Stir in your Black beans and Pinto beans. Mix well continuing to cook. Add your enchilada sauce and mix well. 3. Place your tortillas one at a time in your glass pan, filling one, rolling it and facing the seam side down. Then add another and once it is rolled push it up against the next one so they do not unroll on you. Do this until your pan is full, mine fit 11. With all of the left over stuff in the pan spoon it over the top of your enchiladas including the juice. Shred your cheese on top as much or as little as you like. 4. 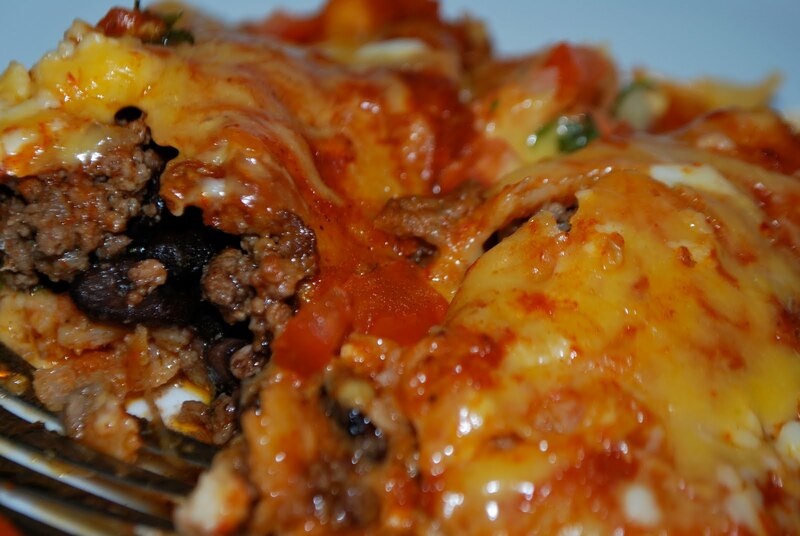 Bake your enchiladas until the cheese is melted. I know your asking what all I changed. I changed the meat from chicken sausage to ground beef (deer meat). It called for stewed tomatoes I used garden fresh. It called for fat free cheese…..Not even going to explain that one haha. I added enchilada sauce to the recipe…they just can’t be enchiladas if there is no sauce….sorry. So many things I usually would not have added like the beans but was really good. This has such a great flavor and is so easy. So here is what you need. 8 oz of my freezer salsa…or a can of rotel. Put your beans and water in a large pot and simmer for 3 to 4 hours. add the salsa and raw sausage and continue to simmer breaking up the sausage as you cook it. Attention all Lactose intolerant people!!! I have tried nearly all of the Lactose free cheese and they are…ummm ok but lets face it if you are someone who loves cheese and you are lactose intolerant the only thing you want in a nice large slice of pizza or lasagna…why because it is the thing your body tells you that you cant have. So the first thing you do is try to work around the fact that you can’t eat these things. You take pills and you buy the tofu stuff and you just deal with it. Well I have something to share. 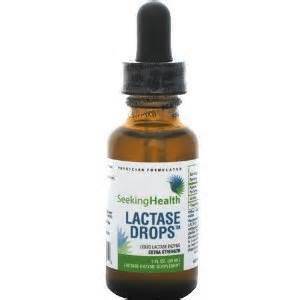 I have talked about the lactase drops on here before but I will share again. What I do is buy a regular gallon of milk and then put these drops into the milk. Once the milk has set for 24 hours you can drink it without a problem. I recently went to a local dairy and bought raw milk (straight from the cow). This also makes sure that there are no preservatives in the milk and makes sure that your milk is as fresh as you can get it. I bought 2 gallons in order to make cheese. I am starting with easy ones and plan to get slowly to the harder ones. My first one that I tried was farmhouse cheese. It was so easy you would not believe it. I poured half a gallon of milk in a large stainless steal pot and brought it to 180 degrees then poured a little over 1/3 cup vinegar in the pot. You then turn the heat off and wait 15 minutes once that is done you strain all of the whey off of the cheese and press it together with your hands or you can use spoons. Try to press as much juice off of it as you can. I poured mine through a small mesh strainer and it was lined with cheese cloth. I then placed it in a plastic container. I was so excited about my first homemade cheese. I made spaghetti and then chopped up small pieces of this cheese and threw it into the sauce. This cheese will not melt and holds it shape. This is the website that I got the recipe from. http://www.olgasflavorfactory.com/breakfast/homemade-farmers-cheese/. Let me just say it was amazing to be able to eat cheese in a meal and not have to worry about it making us sick! 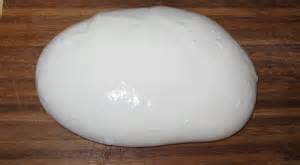 Today I made Mozzarella. I was really worried about this one because I have read if your milk isn’t fresh enough it wont turn out at all. I would hate to waste my time making something that doesn’t work but I figured it was worth a try. So after my drops had been in my milk for 24 hours I tried it. One full gallon of milk poured into my large stainless steal pot and add 1tsp citric acid. I turned my heat to medium low and waited until the heat reached 90 degrees. While that is heating up you dissolve 1/4 rennent tablet into 1/4 cup water and once your milk reaches 90 degrees your pour your mixture into the pot over a slotted spoon. Turn the heat off immediately and stir in mixture for 30 seconds. 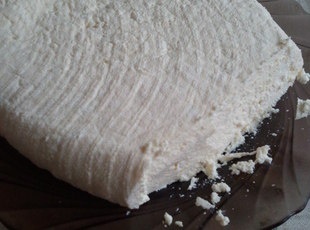 Wait 8-10 minutes then go cut your curd into a grid. Then stir slowly for 1 minute. 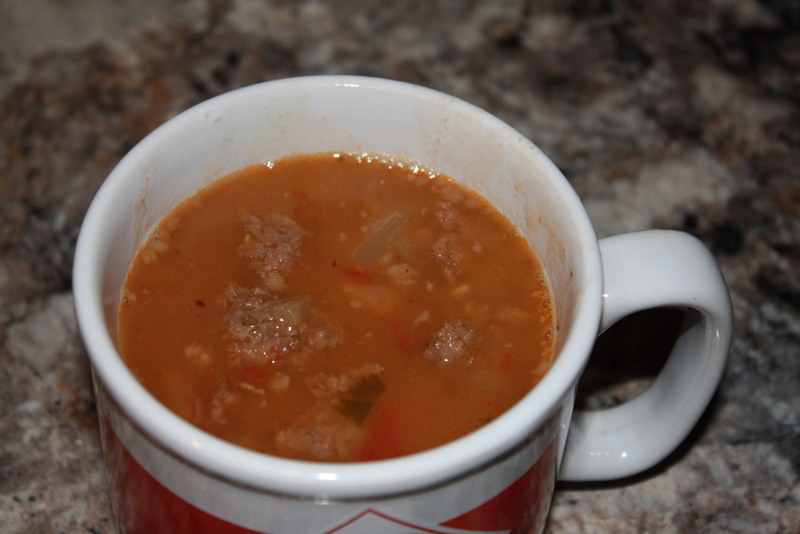 Take your slotted spoon and place in a microwave safe bowl…I used a large measuring cup. 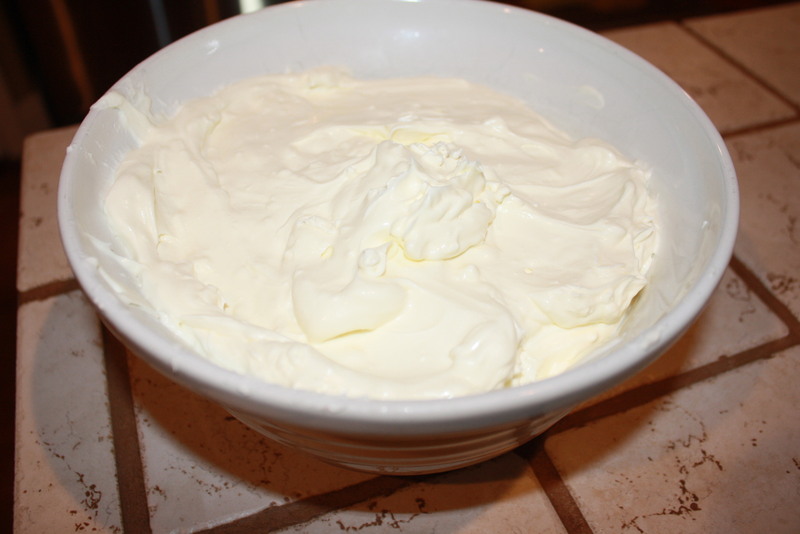 try to get as much of just the curd as you can and pour off any excess that ends up in your bowl. 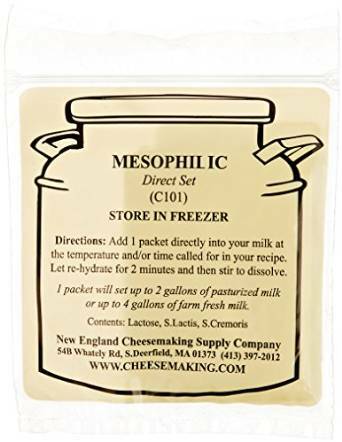 Once you have most of the whey out of your cheese place it in the microwave for 1 minute. Pull it out stir it and pour excess whey off it again and place in the microwave for 40 seconds. Put it back in the microwave for another 40 seconds and pour excess off again. At this point your curds should be sticking together and becoming sticky. At this point you will need to salt your cheese with 2 tsp cheese salt. You will kneed the salt into the cheese and then stick it back into the microwave for another 40 seconds. When it comes out it will be hot but at this point you will need to start stretching it and kneading it so that it will become shiny and stretchy. Once it is shiny and stretchy place it in a ice water bath for five minutes. This is amazing Mozzarella, it’s taste is wonderful and the fact that it is lactose free is amazing. I am making Lasagna Saturday for the first time in over a year. 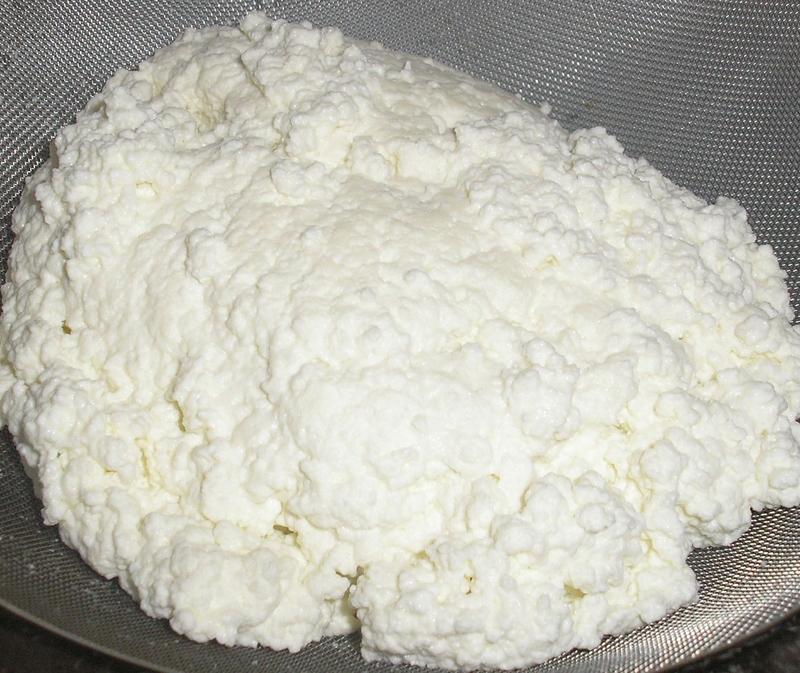 Finally last but not least all of the drained off whey from your Mozzarella that you just made can also make Ricotta. But it has to be made within 3 hours of the Mozzarella or it cools down to much and it wont work. Take the whey and place it back into the stainless steal pot then add 1 quart milk to the mixture and heat it to 200 degrees. After it hits 200 degrees turn off the heat and add 1/4 cup apple cider vinegar. Let it sit for five minutes. Then in a cheese cloth lined strainer pour the liquid through. You can let it drain in the sink or use a pot to catch the whey. I use the leftover whey for bread and pancakes…or anything that calls for milk or water in the ingredients. The ricotta will have to drain for a while mine took 45 minutes. After it was done I placed it into a container for my Lasagna that I am making Saturday. There is nothing more this week that I am more excited over than tasting my lasagna…that wont make us sick. Yay to being able to make my own cheese for recipes that is Lactose free! As always enjoy…I hope this is helpful to someone. Well I had a great idea for breakfast this morning. 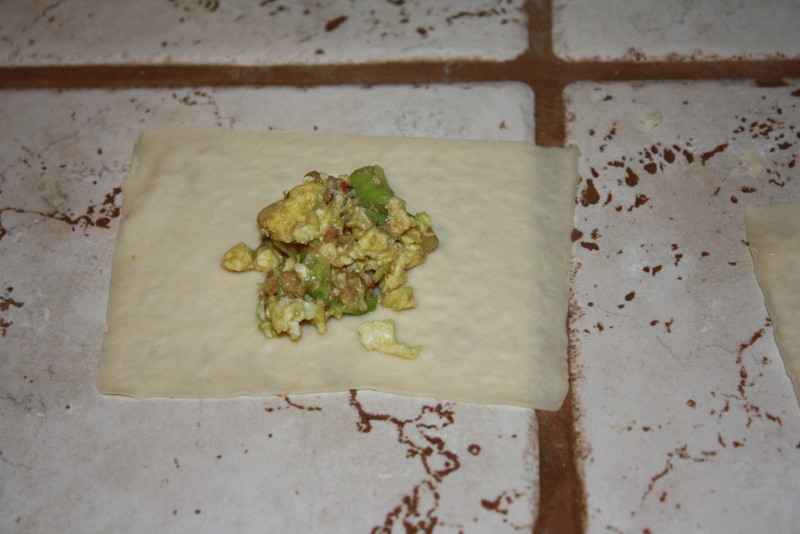 I had some wanton wrappers on hand and thought I might try doing a breakfast thing with them. So in a hot cast iron skillet. 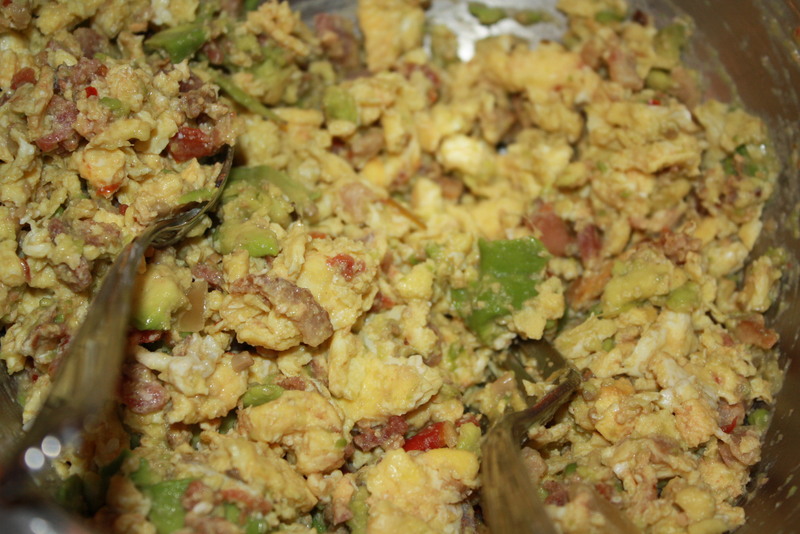 I cooked 6 eggs (scrambled) 3 pieces of bacon then chopped into small pieces, 1 avocado chopped up, and 1/3 cup of my homemade salsa. 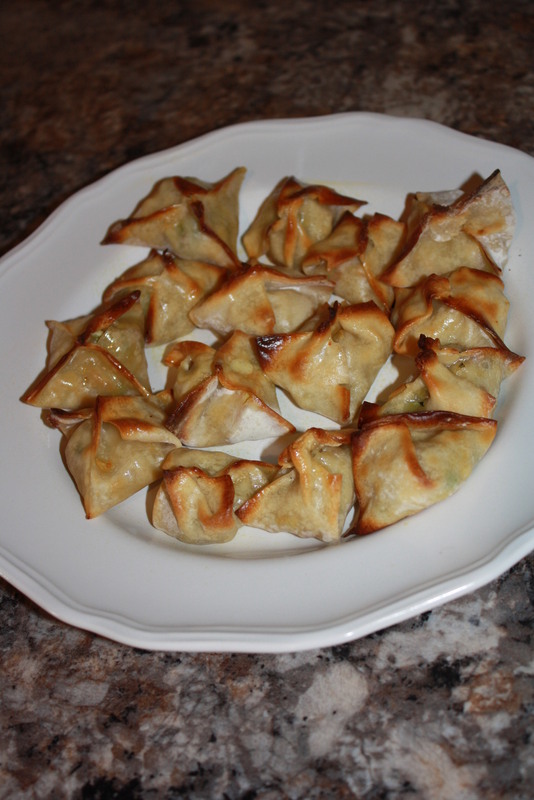 I then threw all of this into a bowl and mixed it all together to make the filling of the wantons. From there I separated my wanton’s so that I could fill them easily and quickly. 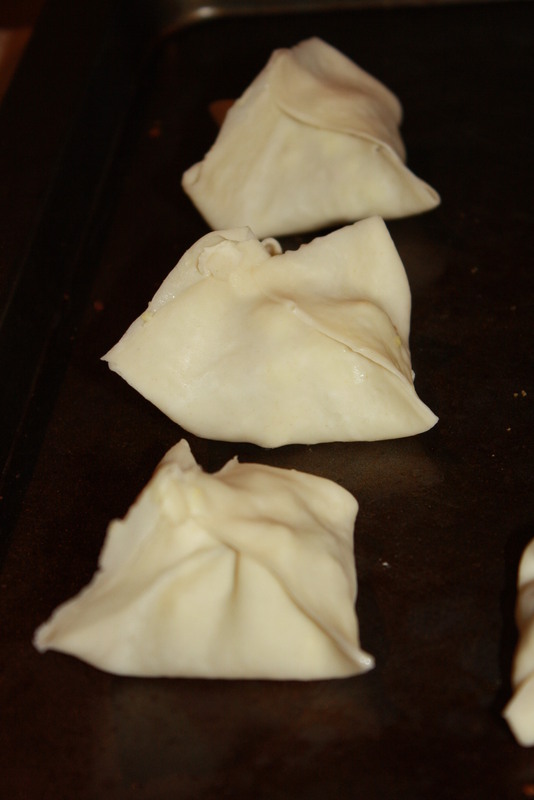 I took 1 teaspoon of filling and placed it into the center of the wanton. Wet all four sides of the wantons with water. I use a brush so I can do it quickly. Then pull all four corners together at the top and seal the open sides to seal in the goodies.